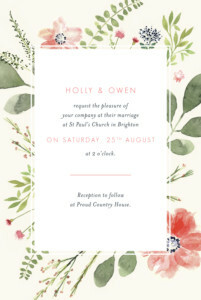 Find out what customers have to say about exclusive personalised wedding invitations from Rosemood. 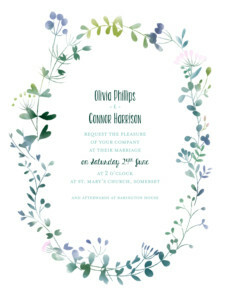 Use these reviews to help find wedding invitation ideas for your big day! 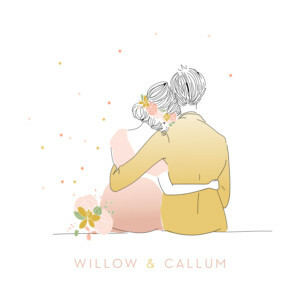 You can also let other brides and grooms-to-be know what you thought about your wedding invitations by leaving a review about the quality of your wedding invitations and your experience of our customer service. 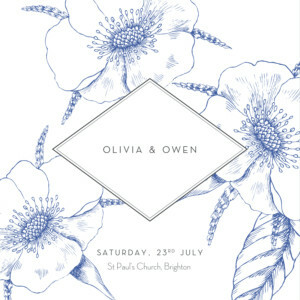 Took me ages to decide on colour and design for my wedding invites. When they arrived I was more than please. So much better than I imagined. Amazing quality. They're fabulous, thank you so much ???????? 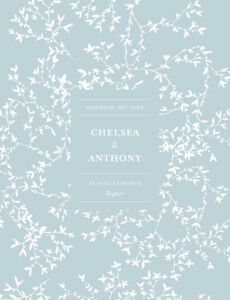 The Bloom invitations look very dramatic and have a very high-quality feel to them. The printing is detailed, neat and accurate and the proofreading and design tidying service is quick and professional. Many of our guests were very complimentary about them and said they would use Rosemood for their own stationery. Really great service kept up to date with changes and helped with the customisation process. Would definitely recommend! The invites came really quick and are great quality. 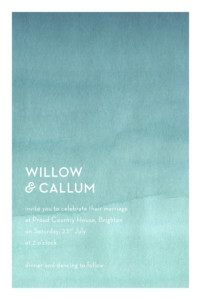 we have had so many lovely comments from our guests about the lovely design colour and quality of the invites! Just one very little thing it will be good if you could get some off white envelopes to match the cards and also we noted the glue on the envelope was not great but once we used the stickers it worked very well. Happy with everything, great quality. I’m blown away. Service amazing and quality amazing!!! I love my invitations. Rosemood were very accommodating to my several changes. Service and delivery were very prompt. I'm now going to order the matching table place cards. Ordered wedding invites which arrived today. Love the invites but the envelopes don't match. When I ordered a sample, I ordered a blue envelope to go with the design and was contacted with the suggestion I change to Ivory as it matched better. I did. Upon ordering all my invites as I was so impressed with the sample, I selected white envelope, as ivory wasn't an option, but also contacted with the request that an envelope to match the card be sent, i.e. ivory. Pearly white envelopes have been sent, which don't match. I know it's just an envelope, but when paying for invites to be made, it's because you want it to be perfect. My wedding is in less than 5 months (only booked 3 weeks ago so last minute date, not that I've left ordering to the last minute) which means I don't have time to wait or source different envelopes as I need my invites out asap. 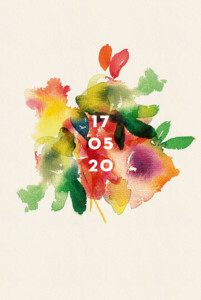 Design and invites themselves are perfect, just disappointing to be let down on a small detail. Thank you for your message and so sorry to hear that you were disappointed with your envelopes. 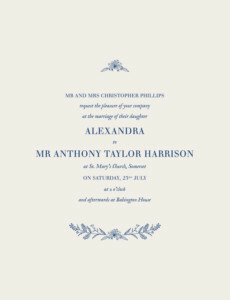 We know that your envelope selection is a very important part of your wedding invitations, a detail that we aim to get just right on every order which led us to first suggest switching from blue to ivory envelopes. We apologise that our ivory envelopes were temporarily out of stock when you placed your final order. Our pearly white envelopes are usually a safe middle ground between white and ivory which was the second best choice at the time but we certainly can't leave you with envelopes that you aren't 100% satisfied with so I have followed up with you to send along new ivory envelopes as they are now back in stock. Thank you again for your feedback and we will get this sorted out for you asap! We got our wedding invitations, rsvp, info cards and orders of service from Rosemood Atelier, they were brilliant quality and when I managed to mess up timings they helped me to ensure I got everything on time, so helpful and nice! Thank you!! These evening invites were beautifully printed, the colours were even better than we expected and our guests commented positively about them, good quality paper and envelopes ???? We got these invites without the yellow background, and since we needed them in 3 different langauges the designers had to adjust the layout for the different size of text. All done very quickly and in style. The invitations went out and our guests loved them, I've had many comments about how beautiful and elegant they are. Mary and Sarah at Rosemood have been incredibly helpful all the way through the process, even when a venue let us down they helped us rework the invite with no problems. I'd absolutely recommend using Rosemood to anybody looking for a classy invitation suite and a company that genuinely cares. Customer service is exceptional here. I had so many questions and they always came back straight away. The invitations are so pretty and of good quality. My guests have also said how lovely they are. Thank you Rosemood for your professional and prompt service. We really appreciated that you checked with us each time the design was proofread, it made us feel we were in good hands. 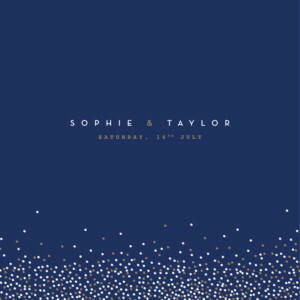 The foil invitations are just beautiful, we're really pleased with them. Your website is so easy to use and I felt very comfortable buying from you. Thank you so much. From start to finish, the customer service I received was top notch. Every single query of mine was answered promptly and efficiently with a very friendly approach. A pleasure to deal with! 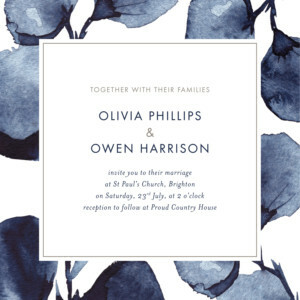 The invitations themselves were gorgeous and I received many compliments about them. Also the price was very reasonable as well. One very happy customer - thank you. I have placed my order in the middle of the Christmas and just 3 weeks before my wedding day but the team replied all my questions immediately and helped a lot to send my order right in time! Many thanks for all prompt responses and many thanks to design team who makes our picture much more better on the cards! Rosemood are professional and so helpful. I couldn’t decide between two types of paper so they sent me a sample of each in my chosen design. Any questions I had they responded the same day. The design itself is perfect for us and we have had so many lovely comments about the simplicity of the it. I will definitely be using rosewood in future and would recommend them to anyone. I ordered both my day and evening invitations for my wedding through rosewood and I wasn’t disappointed. From the first draft they responded very quickly to an error I had made and was quick to change it. The invites are amazing quality and look so beautiful. I have had lots of compliments on them. Thank you Rosemood. The cards are excellent quality and I’ve received lots of great feedback on the style, look and feel of the cards. Can’t wait to order rest of the set! 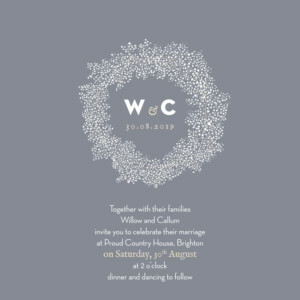 So pleased with the invitations, such lovely quality (I went for the traditional textured paper). Fantastic service too with the proof reading/spell check service! Highly recommend. Really lovely invites! Brilliant quality and fast service! Really great customer service. Quick to respond to questions and very helpful. 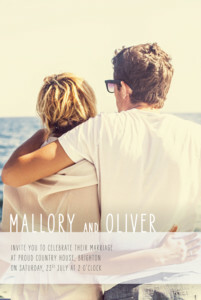 The invitations looked fantastic and everyone seems to love them. Thank you! They are amazing thank you so much for all your help, brilliant customer service. 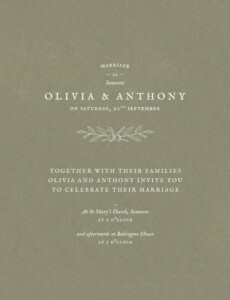 Love these invites we got them on the textured ivory paper and were not disappointed. Great service from start to finish, we sent them all the details, they got back to us with a couple of ideas for improvement. Then after a few days they arrived. 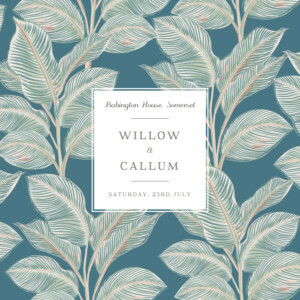 We used these for our evening wedding invitations as the tree was similar to the one outside our reception venue! Really easy to personalise online and Rosemood were very helpful, with their graphic designers improving the layout of our text! We went on to order all of on-the-day wedding stationery in the same design! Thank you for all your help. I liked I could edit it all myself submit that edits and then they were looked over by a professional, sent back and I could triple check. 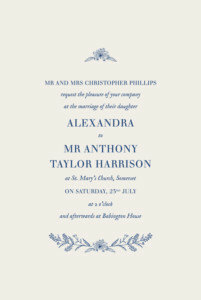 Some of our guests have said how beautiful and elegant the invites are. Love this card and had so many compliments on it. Thank you for your card and the friendly service you provided. 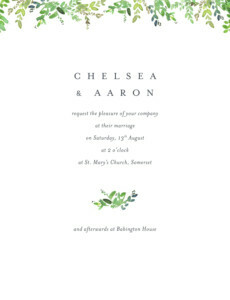 The invites are really good quality and exactly what we were looking for. The ability to have text on both sides is great too. There is also an option to pay a one off fee of £15 and have the cards printed in exactly the colour you want which we did so it can match your theme perfectly. 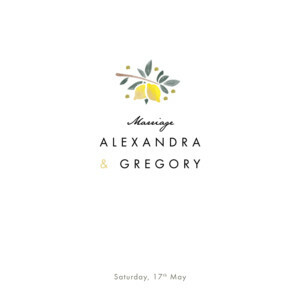 We also ordered the matching 'info' cards but in hindsight we could have put this information on the reverse of this invite instead of just our names and address. I would highly recommend! This design is beautiful, the quality is worth paying for and the finished product is even better. Really smooth.. Extremely fast from start to finish!! So I chose baby's breath in gold... I love them.. Exceeded my expectations.. Felt really cared about as a customer. Liked the fact suggestions were made to improve my product at no extra cost. The cards themselves were beautiful and delivered securely. Great designs and paper quality. The team are so quick in getting back to you with advice regarding any changes. Would thoroughly recommend! From the moment I contacted Rosemood via the online chat they have been nothing but friendly, helpful and professional. 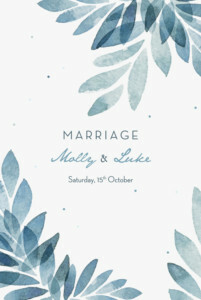 I ordered these invitations in light blue and silver foil, they look amazing and I'm so happy with them, perfect for a winter wedding. The quality and finish is excellent. When I first sent my order through Sandra from Rosemood came back to me to offer suggestions on how Rosemood could improve on my layout and wording. I can't recommend this company highly enough. The price was very reasonable too. Thank you for all the care you have taken I can't wait to send them out now. I will use Rosemood again. 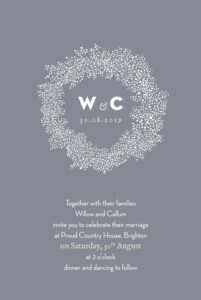 I absolutely love my wedding invitations, the card used is of a high quality and the copper foil has a lovely shine, they use proper foil and not just standard print. I couldn’t be happier with them. The customer service is also amazing. I contacted Rosemood as I wanted to request a sample of the invitations before purchasing them, Sandra sent me a variation of different invites and I received them within a few days along with a lovely hand written card which i thought was a nice touch. 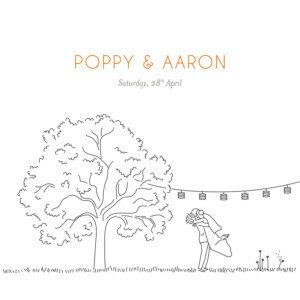 I made a mistake when ordering my invites and notified them straight away, they were so lovely and got everything sorted with no issues. The full expereince has been great from start to finish. I would highly recommend! Great service and easy to use website. We made a few changes, which were tidied up by the in-house team within 24 hours of our submission. Once we’d approved the design we received the finished items (invites and replies) within the week. Our friends have been really impressed by them and loved the simplicity of the design. Well done guys! We picked these particular invitations for our wedding due to their unique style satisfying our desires for something both formal and fun. It was also a bonus that you can add add text to the back. After we submitted our personalised drafts, the staff at Rosemood responded quickly with amendments based on their formatting and proofreading expertise. When we had concerns about white text not being readable at the bottom of the back page, they kindly sent us a complimentary hard copy so we could be see it in person. This was received within a couple of days and looked beautiful. After confirming, we had our final batch within a couple of days and could not be happier with their advice, the process or the finished product. They are always on hand to help. Fantastic company, really a pleasure to deal with. 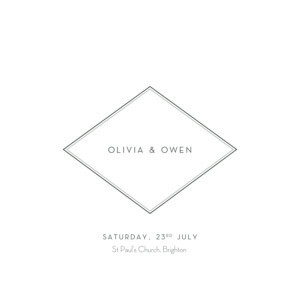 Our invitations are absolutely stunning & we are so pleased with them. Have received some lovely comments from friends & family too. 5* service, would recommend to anyone. 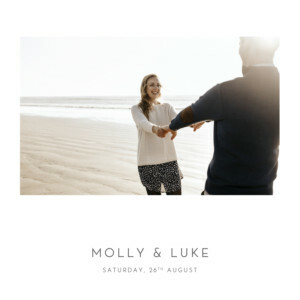 After looking at hundreds of template wedding invitations on other sites and not liking any of them we thankfully came across the beautiful collection from Rosemood. We chose the Provence design for our Italian countryside wedding and it is just perfect. The whole experience was brilliant and easy and they were so helpful and responsive throughout, helping us make sure it was all just right. We absolutely love the end result for all the elements. Really beautiful. I couldn't recommend Rosemood highly enough. Absolutely love them. They are of high quality and look great. I love the profession support you receive to retouch each aspect to make sure they look perfect. 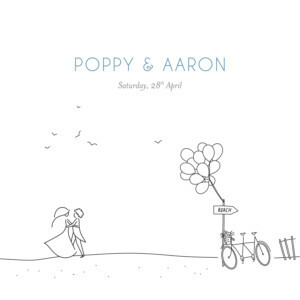 Our invites are so lovely and working with Rosemood has been so easy. 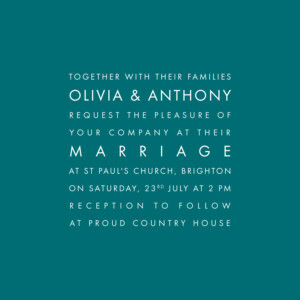 Personalising our invites was quite simple and then the service to proofread, approve and print hasn't been excellent. I highly recommend! I love the design and really appreciate the professional management of the editing. 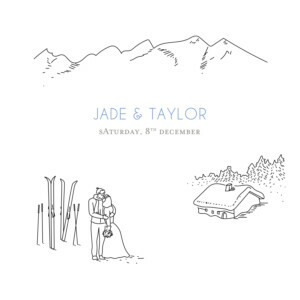 They are everything we wanted our wedding invitations to be, simple and classy. Thank you. 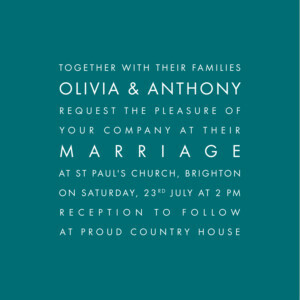 We are absolutely delighted with our invitations and can't wait to send them out. They are just what we wanted and excellent quality at a very reasonable price.